Techlogix helps organizations gain transparency and control of their business processes by implementing state-of-the-art solutions to discover, model, analyze, measure, improve, and optimize business processes. For over a decade, we have been working with enterprise customers to improve their productivity, efficiency, and capacity to rapidly respond to ever-changing market conditions. We employ a methodology-driven transformation approach for incremental and continuous process improvement. Engaging a partner who possesses rich experience of undertaking enterprise-wide process-centric initiatives, who can execute multiple projects in parallel and who can help set up a BPM Center of Excellence at your organization to drive rapid BPM adoption, can help you become a market leader! execution at your organization because of shared responsibility, when no single empowered owner focuses on and is responsible for its health? Techlogix assists organizations in successfully overcoming these challenges to help ensure that their business processes are seamlessly integrated, visible end-to-end, automated, efficient and, most importantly, deliver measurable business value. Techlogix has deep experience of working with organizations in industries as diverse as Financial Services, Energy, Government, Higher Education, Manufacturing, and Telecom. We partner with several leading BPM platform vendors – including IBM, Software AG, Oracle, Bizagi – to deliver cutting edge BPM solutions that also incorporate Integration and SOA, and transition you to the API economy. The business users are very happy with the new capabilities provided to them by this ground-breaking solution. Already, this application has added significant value to the Order Management process. We very much appreciate the partnership we have developed with Techlogix to execute this project in a timely fashion and with such great teamwork with all the other teams involved. This solution is full of creativity and innovation and represents an exceptional effort. Focus on alignment of corporate strategy objectives to process improvement initiatives, performance improvement metrics and business value delivered by BPM. Proven techniques to analyze value chains and identify opportunities to improve processes. Streamlined BPMS application development methodologies that utilize global delivery models to reduce costs while enhancing scalability. Rapid BPM adoption across the enterprise utilizing a CoE approach. Industry-tested frameworks and methodologies to enable BPM implementation and adoption in a structured manner. The Techlogix BPM Framework has evolved over a decade of our working on multi-year engagements at large, complex organizations. It links BPM theory with the practice and the technology in a manner that helps organizations achieve their process improvement goals in a holistic and structured way. Our framework, which includes toolkits based on best practices, builds on foundational work from other industry practitioners and extends their work in practical ways so that it can impact real-world programs and projects. Our perspective is that instead of looking at a process improvement initiative as a one-off project, organizations should approach it as part of an enterprise-wide program that is executed in measured but synchronized steps. Organizations embarking on process-based initiatives can use this framework to align process improvement activities with the IT implementation to achieve quick results as well as long-term process maturity. Cross-functional nature of high value processes and resulting conflicts. Difficulties in integrating with complex heterogeneous legacy systems. Need for multi-dimensional skills in the solution delivery team. Short development cycles of BPM projects. The methodology is a structured approach to addressing the full life cycle of delivering BPM and SOA based solutions. BPX consists of a set of templates, best practices, and metrics that have repeatedly delivered breakthrough project performance and has been validated in multiple real life implementations. We have used a ‘Concurrent Design’ approach to develop a range of cross-referenced models to ensure the integrity and completeness of a BPM solution. 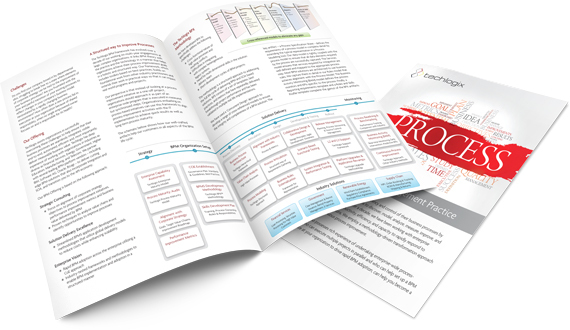 The key artifact – a Process Specification Sheet – defines the requirements of a process model in complete detail by extending the typical representation in a Process Modeling tool. Our data model is tightly coupled with the process model to ensure that all data elements required by the process are successfully captured. The Services model ensures that services required for integration are well defined and mapped to the appropriate process step. Most BPM solutions are architected to use business rules. We capture them in detail in our Rules model that achieves alignment with the Process Model. The Business Activity Monitoring (BAM) model defines the process monitors and KPIs specific to the process. Finally, a Reporting requirements template and a Roles and Skills Profile template complete the gamut of the BPX artifacts. Our client, a Fortune 500 enterprise, is a data communications and telecommunications equipment provider. The company is headquartered in North America and provides products and services around the globe. It is a global leader in providing public safety equipment – from infrastructure to applications and devices such as radios and task-specific mobile computing devices. Techlogix worked with our customer to develop a solution that automates incoming, outgoing and trust to trust account transfer transactions for more than 2,000 corporate users. At the core of the solution is IBM Business Process Manager that integrates the Bank’s accounting system and its enterprise wide content management solution. Techlogix delivers solutions using IBM WebSphere platform. We have 10+ years of project delivery experience on IBM BPM/SOA technology. Techlogix has also redefined its BPX Implementation Methodology to deliver optimal solutions using the IBM product set including IBM Business Process Manager and the IBM Integration Bus. We have developed a strong practice around webMethods that allows us to design and implement complex solutions encompassing Application Modernization, Business Process Management (BPM) and Business Activity Monitoring (BAM), Integration & ESB, B2B, and Service-Oriented Architecture (SOA).